Also needs perforated ladle/boondi ladle. 1. Heat the water and sugar in saucepan on medium high and bring a boil. When sugar is dissolved, turn off the heat. Syrup needs to be lukewarm. 2. Mix chickpeas flour with water and saffron to make smooth thick batter. 3. Heat oil for deep frying. Oil needs to more than 1’’ deep. Otherwise boondi will not be round. Oil needs to medium high. (To test the oil temperature) drop little bit of batter, if it rises immediately without changing colour that means oil is ready. 4. Hold the ladle on the top of hot water and pour ladleful batter. The batter will drop through the holes into the oil. Don’t over crowd the pan (If the batter is too thick it will not drop, that means batter is too thick. Need to add little bit water to make right consistency). 5. Fry them till light golden but we don’t want them crispy. Take out the boondi from oil with slotted spoon and put them directly into lukewarm syrup. Soak in syrup 2-3 minutes and take out boondi from syrup. 6. Repeat the process for rest of batter. 7. Mix the cardamom powder, ghee and sprinkle of water in the ready boondi. 8. 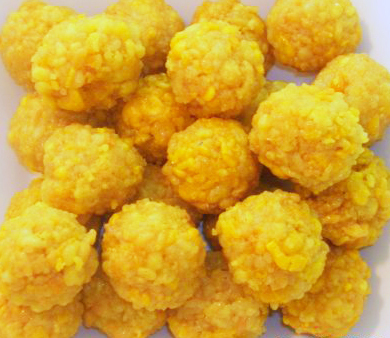 Take small amount of boondi and squeeze gentle between your palms to shape of ball. 9. Finish the rest of boondi repeating the process. This recipe looks wonderful! I have been looking online for any way to buy one of those proper boondi ladles with the protruding bumps. Do you know of any source for obtaining one? Thank you very much for any help in this! Thanks. I get this one from Bangladesh. Where do you live? Check on Indian grocery shop. Next time I will go Indian grocery I will check for you. Apa, making bundia is a lot of work. Indian grocery sales ‘khara bundi’ which is a sugar free bundi. I think you know which one I am writing about. Can I make laddu using that one? Pls give me a recipe to make laddu using that one. Thanks a lot. Also as you said, put khurma in room temp. before adding to syrup. But in syrup I need to cook it in low heat again until i get crystal sugar. Will not it be soft again for heating? Make syrup and add ready made bundia. Cook 2 minutes and with perforated ladle remove from syrup. Follow rest of process.